HECM endorsements declined -12.1% to 4,254 loans. That drop completed the round trip back to February volume levels after a large increase in March, although staying slightly above the monthly average from last year. 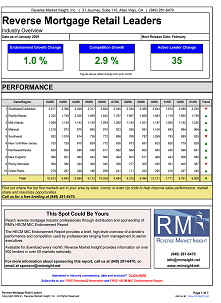 If your company is FHA approved check out the rankings on page 5 of the report below. If your company is not FHA approved, watch out for our next edition of HECM Originators to find your ranking! Click the image below for the full report.